New 3D Imaging Camera Modeled After Insect’s Compound Eyes. Research from Prof. Lee Wing-bun and his team at the Department of Industrial and Systems Engineering at The Hong Kong Polytechnic University (PolyU) has led to a new means of 3D imaging, a technology that maps the surfaces of solid object and turns them into accurate digital representations of the real thing. 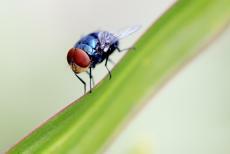 The team has developed a new imaging system, and is calling it the “compound eye for high-density 3D imaging.” The inspiration for this new technology was the physiological structure of flys’ compound eyes, which use many small lenses to refract light, rather than just the one-per- eye structure of most other seeing creatures. Extremely high precision rolled plate machining tools in the manufacturing process, and the result is incredibly detailed 3D images, better than even before seen. Microlens arrays consisting of 12,000 individual lenses enable the technology to acquire realistic 3D images of objects. Images are simultaneously focused for both near and far fields, resulting in a “shoot first, focus later” mantra. This approach to 3D imaging helps solve issues that current technology faces, such as insufficient light and inadequate resolution, which limit the clarity and detail in the final 3D models. The compound eye for high-density 3D imaging can be applied in a wide range of imaging applications, such as high precision surface profile, displacement, and velocity measurements. Looking forward, this type of lens can potentially be used for optical cameras within medical devices, 3D scanners, and even in the production of 3D images for movies and television.